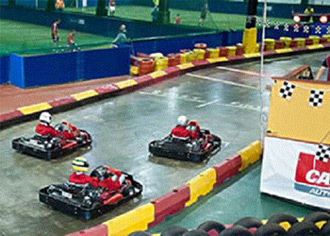 The main karting circuit at Eddie Irvine Sports is one of the finest in Northern Ireland. With a length of just under 400m, this track is both challenging and contains both high speed straights and tight turns to test your ability and control in the kart. Boasting lap times of over 40 seconds the track is definitely worth a visit. Take the A21 southbound and leave at Balloo Road; the circuit is on the right. For groups of 8 or more drivers: 5 practice laps, 4 Heats of 5 Laps each, 2x 6 lap Semi-finals, 1st and 2nd 3rd 4rd placed drivers then go into a final of 10 laps. For groups of 8 or more drivers: 5 Practice laps, 2 x 15 Lap heats, 20 Lap final for the top 8 scoring drivers. A huge rangte of activities and games can be incorporated into a stag party package to suit any size group or budget. Contact us with your details and we will provide all of the details and prices. This modern and well fitted venue has a huge variety of activities to choose from, or to combine to create the perfect corporate event or office party. Provide us with your groups details, and we will be happy to discuss the available options and prices. There are conference facilities for 20-30.